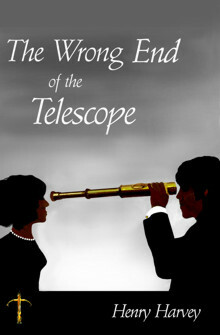 The Wrong End of the Telescope – Coming Soon!!! Mrs. Davis was everyone’s favorite teacher. She always fought the system, even at the end, when her casket refuses to lower into the ground, it’s her one last hurrah. Three of her old students, Charlie Blair, who stuck around to become rich and famous…fixing lawn mowers, Susan, who escaped to become a best-selling novelist, and Beckie, who was the class whacko, all meet at the funeral. There was a silly high-school triangle once, but it never went anywhere. But then there was that one horrible day. School was letting out early for snow, and then it happened on the bus and their lives changed forever. Mrs. Davis helped them out, but…she also wrote a novel about it, not to be published until her death. …For good reason it turns out. Once you get into the book, if you have a question for a particular character, log onto the Ask The Characters Section on this site and…ask the character anything you like. That character will respond directly to you. The best, most interesting or intriguing questions will be posted.